Posted on August 15, 2015	by Katy K.
I love fairy tale retellings and I’ve enjoyed Cat Hellisen’s When the Sea is Rising Red and House of Sand and Secrets – so I was very excited to see this new retelling of Beauty and the Beast! This is one of those older middle grade books that my library shelves in the teen section. I’ll also note for any who, like me, are trying to diversify the authors we’re reading, that Hellisen is South African. 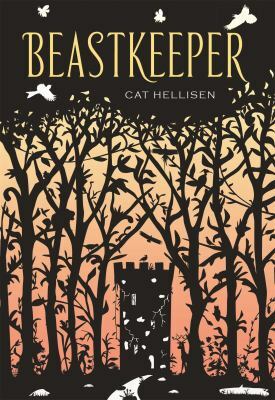 Beastkeeper by Cat Hellisen. Henry Holt, 2015. Sarah has been used to her parents moving at the first breath of cold, but her parents have always been home. Then her mother walks out, leaving Sarah and her father alone. Her father doesn’t seem to realize that Sarah is taking care of him instead of the other way around, until suddenly he decides that Sarah would be better off with her grandparents, whom she’s never met. So off she goes to the cold castle in the woods where her Nanna lives. Sarah’s grandfather is a beast, caged in a shed, and Sarah learns gradually of the curse of jealousy and revenge that has wrapped itself around her family, one that she will not be able to escape unless she can find a way to break it. She’s helped – maybe – by the mysterious boy Alan (properly a Robin or a Puck), whom she’d met in the woods near her own house, as he can travel between woods. Hellisen isn’t one to write light stories, so that while this isn’t as dark as her works for older teens, Sarah and Alan are the most likeable characters in the story, neither of them entirely trustworthy. The evil witch isn’t entirely evil, and Sarah’s cursed grandparents less than sympathetic. For all that, this is a captivating tale, filled with the magic of birds and beasts and woods, the magic in a teddy bear necklace that Sarah’s parents gave her when she was too old to want such a thing. It’s about the mutability of love, the twisted nature of jealousy, and importance of holding on to humanity in the face of forces that want to tear it away. This is must-read for fans of fairy tale retellings, from older middle grade to adult. Pair it with either or both of Robin McKinley’s Beauty and the Beast retellings, Beauty and Rose Daughter, as well as Rosamund Hodge’s Cruel Beauty for older teens, Naomi Novik’s Uprooted for older teens and adults, or The Princess Curse by Merrie Haskell for straight-up middle grade. This entry was posted in Books and tagged Beauty and the Beast, fairy tales, youth fantasy. Bookmark the permalink. No… no falling in love with the beast in this one! It’s a family curse, and she’s inside the curse trying to break it, rather than coming from the outside as the traditional Beauty does.